HISTORY: The history curriculum focuses on studies of ancient Egypt and Greece for the bulk of the year. Comparisons between these civilizations lead to generalizations about cultures as well as to an understanding of their differences. Geography, literature, and the arts are some of the avenues used to explore these subject areas. We will investigate the essential question "What is culture?" and explore the ancient world through map skills, timelines, and charts. ENGLISH: The English program encompasses several different areas of emphasis. Students are introduced to various types of literature and literary themes and techniques. Vocabulary development is also an important adjunct of the literature program. Using a reader’s workshop approach gives students opportunities to practice critical reading skills through different units of study, including inferential thinking, finding themes and motifs within a text, historical fiction, and nonfiction. Different reading skills and concepts are taught through mentor texts, and students are asked to apply these concepts in their independent reading. In conjunction with independent reading, students discuss literature in small book club groups. The goals of the literature program are twofold: to encourage students to enjoy reading and to help them become more perceptive, competent readers, and thinkers. Writing is another essential part of the English program. Students continue to develop both expository and creative writing skills, to increase their knowledge of grammar and the mechanics of writing, and to develop their research and reporting skills. A writer’s workshop approach is used as students brainstorm, draft, revise, and publish their prose. Formal assessment begins at the beginning of the second trimester. Grades are based on projects, oral and written assignments, tests, in-class writing assignments, and homework. History: Sixth-grade Humanities begins with a unit on world geography and mapping skills that raises students’ awareness of the location of continents, oceans, and the countries of the world. It culminates in a research project on various countries that includes presentations using digital media, writing, and providing citations. Our next unit is a comparative study of the five major world religions, Hinduism, Buddhism, Christianity, Judaism, and Islam. Both the geography and world religions studies raise awareness of cultural universals and diversity, as well as examinations of identity and stereotypes. A significant portion of the year is devoted to an in-depth study of the European Middle Ages beginning with the Dark Ages and proceeding through successive examinations of the three “estates” of medieval society — the nobility, the peasantry, and the clergy. This study also involves the creation of a Medieval Museum and a research report on cultures around the world outside of Europe during the same period. The year concludes with a shorter unit on the European Renaissance. Students gain knowledge and develop critical thinking through activities such as reading, discussion, writing, research, using technology, art, and projects, with frequent written responses to issues and ideas. English (Literature): The sixth-grade literature program exposes students to a variety of literary genres and terms, inspires them to enjoy and deepen their understanding of literature, and teaches them to respond actively, expressively, and critically to what they read. Class literature is largely integrated with the History curriculum through several works of historical fiction. In addition to independent reading and books read aloud, class books include The House on Mango Street; Catherine, Called Birdy; A Proud Taste for Scarlet and Miniver; and A Boy of Old Prague. ; and Roll of Thunder, Hear My Cry. At the end of the year, the girls break into book groups tothat each read one of fourseveral different books set during the Great Depression, an additional unit of historical learning. English (Language): Writing, both expository and creative, is a major emphasis of the sixth-grade English curriculum. In the writers' workshop, students develop their abilities to express ideas clearly and effectively in a number of genres (personal narrative, fiction, paragraph composition, essays, poetry) and to read and respond to others' writing critically. Writers' workshop offers students the opportunity to practice techniques of brainstorming, revision, editing, and proofreading; to identify and practice the traits of good writing; to expand their knowledge of conventions in grammar and writing mechanics; and to explore different modes of written expression. Writing is taught and critiqued using the 6 Traits of Writing: ideas, organization, voice, word choice, sentence fluency, and correctness of conventions. Emphasis is placed on both personal expression and discovery of one's own voice, as well as on clarity of exposition that stresses precision and efficiency of language. There are also ongoing classes on grammar, including parts of speech, punctuation, and sentence combining; vocabulary development (using content from literature, writing, and History); spelling; speaking, listening, and study skills. Trimester grades are determined by averaging the grades earned on homework, quizzes, tests, and the writing portfolio, with larger projects and tests weighted more heavily. In English, we strive to develop confident, appreciative, and analytical readers and writers. This growth is supported by work on critical reading and comprehension, the writing process and writing mechanics, vocabulary development, and grammar. The English course also includes a component of independent reading, fostering our students’ love of reading as a lifelong activity. Literature: The goals of the literature program are to inspire students to enjoy reading, to expose them to a variety of literary genres, to help them develop their views of themselves and the world, and to teach them to think actively about ideas they encounter. Through our literature selections, we examine themes related to cultural identity, change, and what it means to move from one stage of life to another by reading, discussing, and responding to a variety of texts. The girls read the novel Full Cicada Moon by Marilyn Hinton the summer before beginning seventh grade, and we spend the first few and we spend the first few weeks exploring themes related to the book. Our next unit will explore such essential questions as “What does it mean to be a community?” and “What does it mean to be American?” through the 2016 novel Towers Falling by Jewell Parker Rhodes as well as news articles, primary sources, and service-learning projects. The next unit revolves around a book of historical fiction (Keeping Corner, by Kashmira Sheth) that allows students to continue the exploration of cultural differences as well as how events current to the book’s time period play into the development of identity and culture. Students will culminate that year in differentiated book groups, reading and discussing a variety of books, developing their small group leadership skills, writing a variety of letters, and practicing and demonstrating their literary analysis skills through in-class writes. Writing: In seventh-grade English, students develop their abilities to effectively express their ideas and to read and respond to writing critically. They practice several modes of writing, including journaling, assignments focused on description, and the expository essay. To strengthen each student's writing structure and understanding of mechanics, style, and organization, we focus on writing as a process and encourage drafting and engagement with the 6 + 1 Traits of Writing. Periodic goal setting and writing conferences also play a major role in the each student's development as a writer. Grammar: The primary objective of seventh-grade grammar study is to develop a firm understanding of the parts of speech, parts of a sentence and punctuation. In the winter, we take a break from formal literature study to deeply dive into a grammar unit, where the parts of speech are reviewed and more deeply understood through the use of art. Students then transfer their understandings into group, projects and individual assessments developed around the usage of the parts of speech. Assessment: Grades in English reflect the variety of assignments and activities. The overall grade is determined through two main categories — Homework & Quizzes, and Writing & Projects. Grades for homework are earned through thoughtful and thorough completion of each assignment. To encourage the development of critical thinking, analysis, and writing skills, every essay assignment includes a drafting and revision process. For some assignments, students may have opportunities for further revision; at times, additional revisions will be required. The objective of this course is to improve students' confidence and competence in writing, reading; and critical thinking while exploring who they are through literature. critical reading signposts.6 + 1 Traits of Writing. We will especially focus on how to actively read text and develop deeper understanding and questioning skills. the elements of theme, symbolism, and characterization. We begin the year with a focus on injustice and inequality through the assigned summer reading novels. Throughout the year, students will also explore how they relate to each work of literature and how it can help them to understand the world around them through our main essential question: "What does it mean to be human during times of adversity and crisis. And what can I do?" After finishing our summer reading unit, students will continue to explore the elements of literature and the main essential questions through reading various memoirs and primary source documents to explore youth voices during times of crisis like experts from Anne Frank’s diary during the Holocaust, unpacking the terms “refugee” and “immigrant through The Book of Unknown Americans by Christina Henriquez, examining the role of an upstander in Sophocles’ play Antigone, and finally looking at transgender rights through our reading of Gracefully Grayson by Ami Polonky. The Diary of a Young Girl by Anne Frank; a poetry unit; Romeo and Juliet by William Shakespeare, and Gracefully Grayson by Ami Polonsky. Writing: The writing curriculum is based on the idea that we write to learn, to express ourselves, and to become stronger and more fluent writers. Assignments are designed to help students deeply investigate literature and develop their own writing processes. As in seventh grade, this year students will continue to develop their use of textual evidence and supporting a thesis (claim) statement in expository essays, as well as begin to delve more deeply into the idea of literary analysis. Students also keep an online journal that they are encouraged to write in during short writing prompts at the beginning of class or for more personal reflective writing as they read. Periodic goal-setting, reflection, peer editing, and writing conferences play a major role in the students' development as writers. The 6 + 1 Traits of writing will continue to be a lens through which we will look at the entire writing process. Brainstorming, drafting, revising, and editing will be stressed. Vocabulary: Since a strong vocabulary is best built by reading literature and by recognizing and learning new roots, students will review Greek and Latin roots, as well as collect and study words from their reading and use them in their writing. Grammar: Building upon students’ knowledge of the parts of speech and parts of a sentence, our study of grammar focuses on further developing sentence fluency, especially during the editing process, to give context to students' grammatical understanding. We will revisit punctuation rules and guidelines. By analyzing composition models, students will explore the many ways to write effectively with varied and complex sentence structures. Grades for homework are earned through thoughtful and thorough completion of each assignment. To encourage the development of critical thinking, analysis, and writing skills, every essay assignment includes a drafting and revision process. For some assignments, students may have opportunities for further revision; at times, additional revisions will be required. This course focuses on how cultures affect one another and how the spreading of ideas influences the development of culture. We will examine the nature of cause and effect in history and the advantages and challenges associated with increased connectivity within the world. We will begin by building a true understanding of our own culture(s) as a way to gather insight and perspective. From here, the course will focus on four slices of history that will illustrate the dynamics of how cultures influence those they come in contact with. In the first trimester of seventh-grade history, students are introduced to the “Four Worlds”: political, economic, social, and cultural, each having its own set of actors, each with various sources of power and influence, each with different and often conflicting priorities. We began with the “four worlds of me,” an activity designed to help students understand how they are part of each world, how they are affected by conditions in each, and how they are able to influence conditions in each. Students also read the “Nacirema” article and discussed cultural assumptions and the concept of cultural distance. Students also discuss what professional historians actually do. We will begin our exploration of how the dissemination of information affects the world by studying the culture of ancient China and how its inventions of the compass, gunpowder, paper, and movable type helped shape the world around us. We will then examine how the Pax Mongolica created safety and stability along the Silk Road, in turn leading to increased trade and communication between the East and West. Next, we will look at how Islam embraced trade and built upon the knowledge of both east and west. Students will explore the geography of the Middle East and North and West Africa and study the origins, expansion, and contributions of Islam (such as an improved compass) as well as the trade and wealth of the Mali Empire. Students will also examine the impact the emergence of Islam had on the medieval world. After the fall of Constantinople to the Ottoman Turks, Europeans had to look for other passages to ports in the East. Students will explore the trade and economic factors that led European governments to seek new trade routes to Asia, and how this process came to shape the world as we currently know it. Through this unit, students will begin to understand basic economic fundamentals and the social and cultural impacts of exploration in Europe, Africa, the Americas, and Asia. Students will analyze the impact of the printing press on Europe and explore the impact of the paper and movable print, first developed in China. As we study the Protestant Reformation, we will see how the ability to print quickly, cheaply, and in multiple languages sparked curiosity in Europe, leading to the Scientific Revolution and the Enlightenment and shaping the world of today. In this unit, each student conducts research, writes, and creates a display about her family heritage and/or the history of her community. The project is both a culmination of our study of cultures from around the world and a celebration of the rich cultural diversity and experiences in our community. The project will take place over a seven-week period, with students given time to work on their research and writing projects in class. This course focuses on the study of various themes within American history, taking an in-depth look at select topics and ensuring that students have an overview of the general timeline of U.S. History. Our study is guided by the concept of living in four worlds (political, economic, social, and cultural) and by the theme of rights, including citizens’ rights, states’ rights, and human rights. In addition, we will delve into current events in order to understand the relationship between past and present. In the first trimester, students are introduced to the “Four Worlds”: political, economic, social, and cultural, each having its own set of actors, each with various sources of power and influence, each with different and often conflicting priorities. We begin with the “four worlds of me,” an activity designed to help students understand how they are part of each world, how they are affected by conditions in each, and how they are able to influence conditions in each. Next, in independent study projects presented to the class, students research the events that led 13 colonies to form the United States of America and find parallels between these events and the 2016 U.S. election. For the remainder of the trimester, we will discuss the election and study the structure of our government. In the second trimester, students will learn about the events leading up to the writing of the Constitution and its safeguards against tyranny. Students will learn about the ideas of Federalism and Anti-Federalism and further discuss the separation of powers within the U.S. government. Students will also examine the Bill of Rights, research Supreme Court cases involving the amendments, and create presentations involving both. Finally, we will begin to look at the growth of the country and its Westward expansion. Students will study the new nation and the different societies that emerged in the North and the South, analyzing geography’s role in creating different economic systems which in turn supported very different cultures. Included in this analysis will be an in-depth look at how, by ignoring the implications of slavery, the new republic set the stage that eventually led to the American Civil War. To close out the semester, students will then research a local or national topic that they believe worthy of reform in today’s society (local or national) and create a Present Day Reform Project, taking action to advance a cause that they believe merits their time. 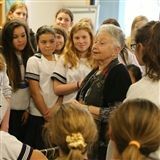 There aren't many left who can speak first-hand about the events of World War II and the Holocaust, and one came to Burke's on the afternoon of Thursday, November 13, to share her story with 8th graders in the Media Room. Bank Street College of Education - M.S. University of Rhode Island - B.S. University of Texas, El Paso - B.A. University of Texas, El Paso - M.A. New College of California - M.F.A. Sarah Lawrence College - M.F.A.